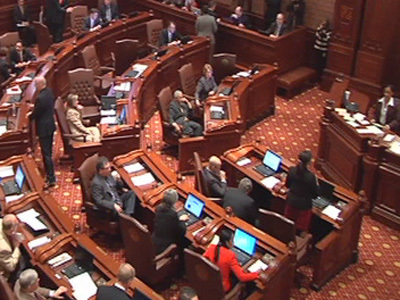 On Valentine's Day, the Illinois State Senate approved marriage equality legislation by a vote of 34-21. The legislation now heads to a House committee. Valentine's Day for LGBT couples in Illinois just got a little sweeter, as this morning, the Illinois State Senate voted in favor of marriage equality by a margin of 34-21, according to the Windy City Times. The Religious Freedom and Marriage Fairness Act now heads to the House, where supporters say passage is not yet assured, according to Windy City. "The momentum is building," said Rep. Greg Harris, the House sponsor of the legislation, in a statement. "More and more House members are telling me they want to be on the right side of history and that they intend to support the bill. Support for marriage equality is growing nationally and in Illinois, and we’re seeing that reflected in the mood of the House." Governor Pat Quinn, a Democrat, has been a vocal supporter of the legislation and promised to sign it should it arrive on his desk. "While this historic day is only half the battle, the Senate today put Illinois on the road to recognizing that, as President Obama said in his inaugural address, 'the love we commit to one another must be equal'," said Equality Illinois CEO Bernard Cherkasov in a statement. Today's vote means Senate president John Cullerton got his wish to pass the legislation out of his chamber on Valentine's Day.